Every year, Software Advice talks with thousands of professionals looking for the right customer service solution for their small business. This provides us with unparalleled insight into the needs of customer service software buyers across a wide range of industries. 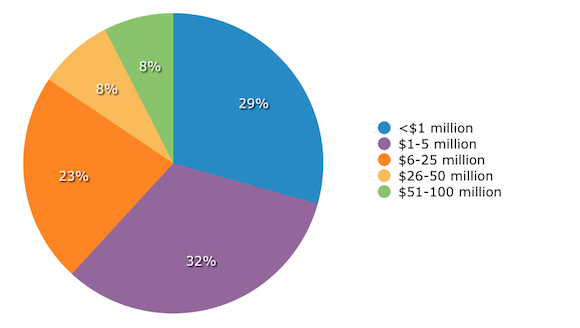 We recently analyzed a random selection of 385 of our interactions with buyers from small businesses (companies earning less than $100 million in annual revenue). 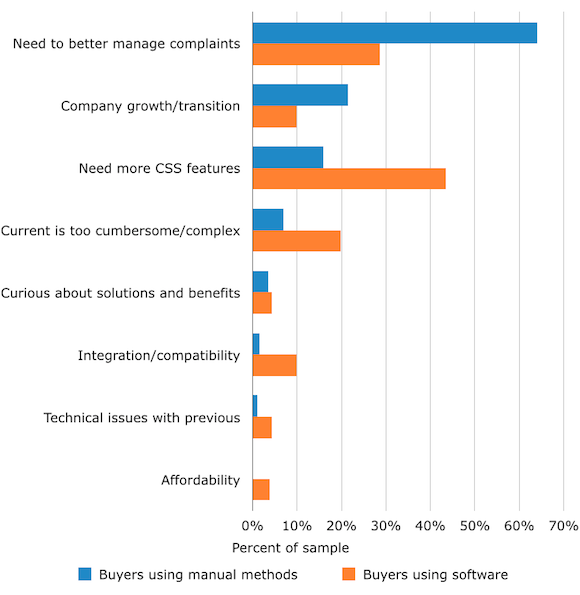 Our goal was to pinpoint the most common reasons these buyers look for new customer service and support (CSS) software, what features they most often prioritize when making a purchase and what the top customer service software buyer trends were among SMBs in 2014. Most potential buyers were using manual methods such as email to manage customer support, with only 14 percent using dedicated CSS software. Small businesses buying CSS software for the first time were significantly more likely to say they struggled with managing customer complaints. 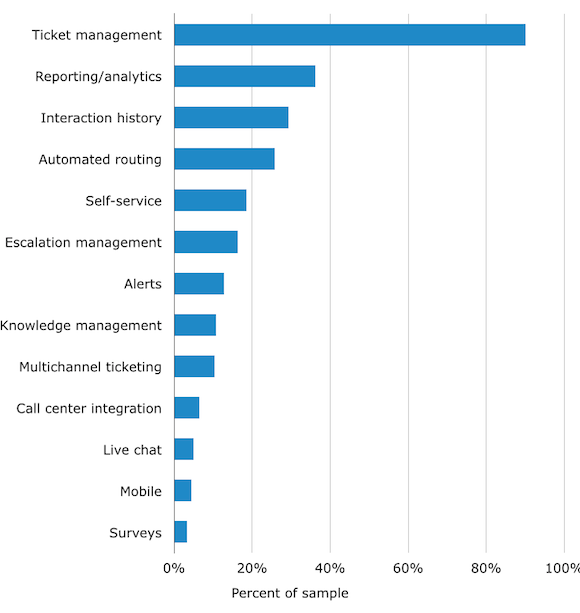 The vast majority of buyers (90 percent) requested basic trouble ticket management, with an additional 36 percent looking for reporting features. To gain further insight on these findings, we shared them with customer service consultant and frequent Forbes contributor Adrian Swinscoe. His thoughts on the data are included in the report below. Over half of buyers in our sample (52 percent) were using manual methods to manage their customer support functions. Most often, this meant using a combination of paper, spreadsheets and email managers to keep track of interactions, while corresponding with customers over the phone and email. Other buyers were using software lacking dedicated CSS features (e.g., trouble ticket management) to handle customer support functions. A total of 12 percent were using sales- or marketing-centric customer relationship management (CRM) software to log customer interactions, and another 12 percent were using a range of other software—most commonly, project management and call center software—to track complaints. This leaves only 14 percent of small businesses that were looking to upgrade from software with dedicated customer service functionality. Of those small businesses using manual methods to manage customer support functions, nearly two-thirds (64 percent) cited a general need to better manage customer complaints as a primary reason for evaluating software. Many said that customer inquiries were “falling through the cracks,” or that a perception of poor service had directly cost them business. As Swinscoe argues, it’s no surprise that so many first-time buyers chose to evaluate software because they were struggling to manage inquiries. “Small businesses generally react to the issue at hand. They say, ‘let’s put out the fires first, and when we’ve put out the fires, we can think about what we need to do for the future,’” he says. 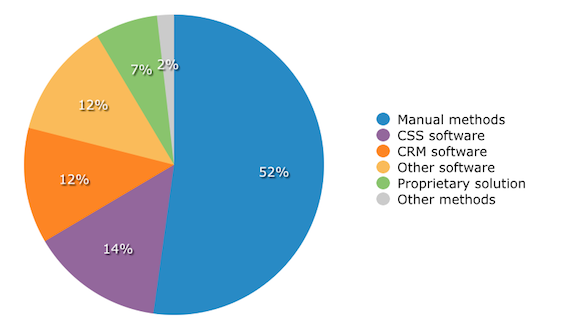 Conversely, our data suggests that more buyers with a software solution already in place (including CSS, CRM or one of the “other software” options described above) are managing to contain those fires: only 29 percent said they were shopping for software in order to address widespread difficulties handling customer complaints. Instead, these particular buyers were far more likely to cite the need for a specific CSS feature that their current system lacked (43 percent cited this reason, vs. just 16 percent of first-time buyers who were using methods such as email and spreadsheets). For instance, many buyers using CRM software said they needed a dedicated ticketing system, and many using CSS software said they wanted a product with more advanced analytics or self-service features. The overwhelming majority of all small-business CSS software buyers we spoke with (90 percent) requested a solution with the ability to generate and manage a trouble-ticket queue from incoming customer inquiries. According to Swinscoe, this makes particular sense for first-time buyers. Many buyers (36 percent) also requested reporting and analytics features of varying complexity (e.g., displaying the volume of tickets segmented by the type of issue addressed). Others asked for specific ticket-management features, such as the ability to track and catalogue each step taken to resolve each ticket (29 percent) or to automatically route tickets to the most appropriate agent (26 percent). Another 19 percent requested self-service functionality, such as the ability to manage customer portals and lists of frequently asked questions. Swinscoe thought this was an accurate number, saying that even though some buyers were drawn to the possibility of using self-service tools to ease the burden on support staff, other buyers were understandably cautious about the investment required to make self-service really work. “Bigger firms are more likely to have the resources to build those knowledge bases that will then help fuel and drive the self-service,” Swinscoe says, whereas smaller businesses may not. “[Smaller firms] think, ‘yes, it might pay off—but in the meantime, it would probably distract us from dealing with existing inquiries, which might actually exacerbate the problem. 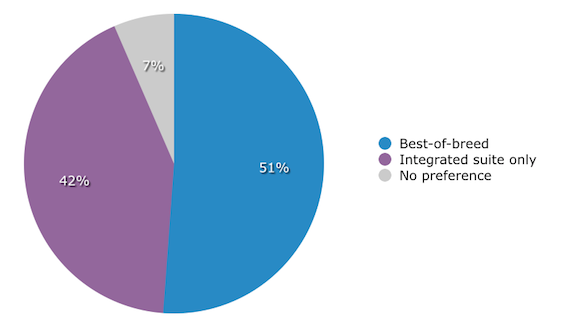 A narrow majority of buyers in our sample (51 percent) requested a standalone or “best-of-breed” solution focusing solely on customer service, as opposed to a larger “integrated suite” that also includes CRM, marketing or call-center functionality. According to Swinscoe, many small firms don’t necessarily have the time or the resources to pay for and implement a range of specialized software systems. Rather than go through the same process three or four times, best-of-breed buyers would rather just go through it once, even if it means having to stretch the solution’s functionality. One of Swinscoe’s clients, for instance, purchased a help desk solution and uses the ticketing queue to manage interactions with leads. However, many buyers (42 percent) were looking for a broader suite. Most commonly, this meant they wanted a product to integrate customer service functionality with call center software or with CRM applications—such as contact management and sales force automation—that would allow CSS agents to access customer information collected during the sales process. Swinscoe thought this was a surprisingly high number, because typically, only larger organizations have been moving towards “a comprehensive, unified view of the customer,” since purchasing and implementing broader suites involves a much more significant investment in both time and resources. This suggests that a significant number of small businesses are taking advantage of the growing number of more affordable, cloud-based software options coming onto the market. These businesses are integrating customer service software with sales, marketing and other solutions to pursue the more sophisticated CRM strategies that, until recent years, have been the sole purview of large firms. 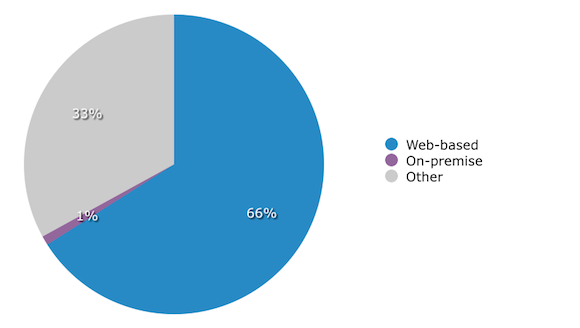 Nearly two-thirds of small-business buyers (66 percent) requested Web-based software (hosted in the cloud), with only 1 percent asking for an on-premise deployment (meaning software that is installed locally, on the company’s own servers). This is consistent with our recent research about trends in businesses’ software deployment preferences, which reveals that buyers have been increasingly drawn to cloud-based solutions over on-premise options since 2008. This holds particularly true in the CRM and CSS software markets, where the abilities to access contact data from multiple devices and easily customize applications are especially attractive. Cloud-based software products make particular sense for small businesses seeking CRM solutions—including those seeking CSS software—since Web-based deployment drastically reduces upfront investment and installation costs and typically comes with monthly subscription pricing, allowing this software to scale well for growing companies. In addition, it can be difficult for small businesses to dedicate the IT resources necessary to maintain a system on their own servers. 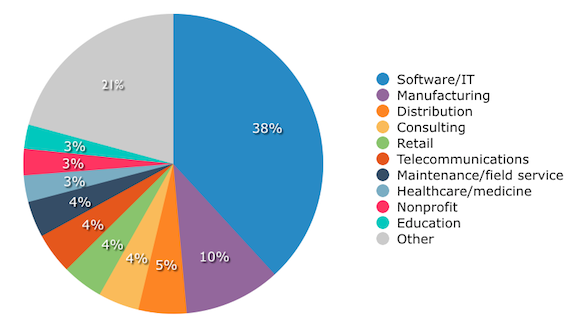 Many of the buyers we spoke with (38 percent) represented small software or IT companies. Manufacturing was the second-most represented segment, at 10 percent, followed by a diverse range of other industries such as media, banking and transportation. As mentioned in the introduction, we limited our sample to small businesses bringing in under $100 million in annual revenue. Of the companies we included, 29 percent earned less than $1 million per year, and 32 percent earned between $1 million and $5 million. The detailed methodology for this report can be found here. Are AI-Enabled Chatbots Ready for Customer Service?